Ancient Egiptian Legends is not a simple essay on the Egyptian mythology and religion, or on the mysteries and the secrets of a great ancient civilization, like many today can be found in bookstores. It's a real journey of initiation, supported by historical rigor and competence of its author, a historian and archaeologist who devoted all her life in search of the most authentic roots of human civilization on Earth and to the discovery of the most genuine Western Tradition and spirituality. Margaret Alice Murray was a famous and unforgotten Anglo-Indian egyptologist, archaeologist, anthropologist, historian, and folklorist. The first woman to be appointed as a lecturer in Archaeology in the United Kingdom, she worked at University College London (UCL) from 1898 to 1935, served as President of the Folklore Society from 1953 to 1955, and published widely over the course of her extraordinary career. Murray's work in Egyptology and Archaeology was widely acclaimed and earned her the moniker of “The Grand Old Woman of Egyptology”, although after her death many of her contributions to the field were overshadowed by those of Petrie. 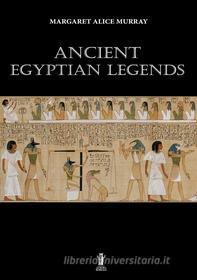 Scrivi una nuova recensione su Ancient egyptian legends. E-book e condividi la tua opinione con altri utenti.